Crusaders manager Stephen Baxter. Pic by Pacemaker. It proved to be an afternoon of frustration for each manager on Saturday as Crusaders lost the lead to a late Glenavon goal at Seaview. As a result, Crusaders boss Stephen Baxter conceded it was a case of two points dropped for his title-chasing side. The Crues retain top spot over Coleraine in the Danske Bank Premiership but now only on goal difference. 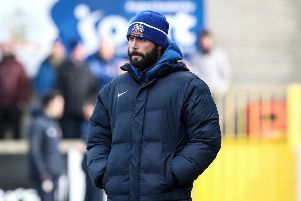 Glenavon boss Gary Hamilton finished pleased with the performance from his players but angry at a penalty appeal turned down with the scoreline at 0-0. “It has to be two points dropped,” said Baxter. “The chances we had in the first half, Jonny Tuffey has made three great saves, we’ve hit the crossbar then scored the goal. “To then not go in and score again, Tuffey makes a stunning save, Jordy Forsythe should have wrapped it up and the game should have been done. “But when you don’t get that goal you need you allow the team an opportunity and they got that one they put into the box and then clipped the top of the crossbar towards the end as well. “The first goal was worth the admission money, a marvellous goal. “I asked our players to go and play and I felt it was a good quality game. “There’s always a little bit of anxiety when it gets to this stage of the season but we’ve got to shake that off. “Nothing is handed to you on a plate, you’ve got to work incredibly work, endeavour to give your best every week and I’ve congratulated the players on how hard they worked. “They haven’t got the job done today as they would have liked but after 35 games the name of Crusaders still sits at the top of that league. “That will do me right now. “It’s so unpredictable, Glenavon have been free-scoring this year, Coleraine have been exceptional, we’ve been exceptional, Cliftonville are on a roll, Linfield are a great side, Ballymena have caught into the top six. “None of those games are going to be easy, we just have to play our fixtures and go in with confidence. “It all moves on very fast no matter if you win, lose or draw. The absence of striker Darren Murray proved a talking point. It is understood the January signing was named on one initial teamsheet before Murray’s non-appearance forced Crusaders into a late reshuffle. “For the third match in a row we feel a major decision has gone against us,” said Hamilton. “It was a stonewall penalty on Mark Sykes. “There’s £220,000 at stake, massive money and decisions can really cost you. “Now in three games we think it has cost us at least two points, possibly five or more. “I would like to see what would have happened if we had managed to get our nose in front, which you need here. “If that (penalty) had gone in it’s a totally different game. “You come out and situations like that are costing us at the minute. “We were down to our bare bones, with the centre-backs you could see from minute one Andrew Doyle wasn’t right and we felt we might get 10 minutes out of Simon Kelly so he came on and did really well, with Caolan Marron out still and Kris Lindsay injured. “Crusaders are a formidable force at home and you know it is going to be a difficult game. “We work so hard, with players out of position and at one point today we had a winger at left-back, two full-backs at centre-back and another winger at right-back. “We knew physically from set-plays we couldn’t compete but the boys were marvellous. “Over the game I felt we deserved a draw, I know they had chances but we worked the goalkeeper too.